Rory McIlroy is a member of both the European and PGA Tours. He is a former World Number One and a two-time major champion. He won the 2011 U.S. Open, setting a record score of 16-under-par on his way to an eight-stroke victory. The following year he won the 2012 PGA Championship at Kiawah Island by a record eight strokes for his second major championship victory. At the Ryder Cup, he played for Europe against the United States in 2010, 2012, 2014, and 2016, with Europe winning the first three matches. 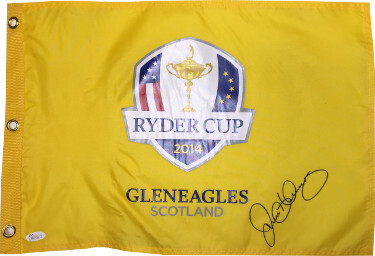 For his individual and team achievements he has twice been named RTÉ Sports Person of the Year, in 2011 and 2014.. Rory McIlory has hand signed this 2014 Ryder Cup Gleneagles Scotland Golf Pin Flag. JSA Hologram #M89426 and Certificate of Authenticity. This product was added to our catalog on Tuesday 24 July, 2018.